Heavy ice and snow loads can cause significant problems for trees. Branch tips and whole branches may break under heavy loads, and in windy conditions entire tree tops can come crashing down. 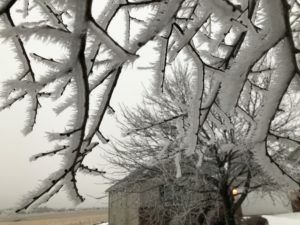 Freezing rain on February 4, 2019 covered trees around the state with a ¼” thick layer of ice. The weather then turned bitterly cold, leaving the ice stuck to the branches, weighing them down and straining the trees. Following that event, a snow storm affecting most of the state led to more ice, snow and damage to branches. These extraordinary ice formations may look light and frosty, but they add a lot of weight to tree branches and can cause branch breakage. Some trees are more susceptible to winter damage. Small trees can be particularly prone to injuries caused by heavy ice and snow. They can bend so far over from the weight that their tops are near or even touching the ground. In some cases, their stems may break at ground level causing the entire tree to fall over. 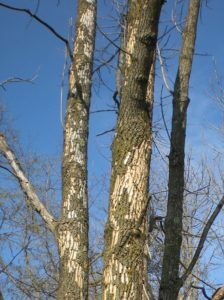 Other vulnerable trees include those with ingrown bark at branch unions. This type of branch union is weak and more likely to split under heavy loads. These young white pines were coated in ice, causing them to bend over. 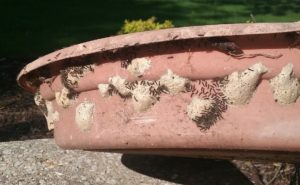 They may not rebound well after the ice and snow melt. 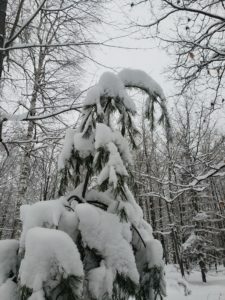 The heavy snow on the branches of this young white pine have caused the branches to droop and the top to bend over significantly. Heavy snow loads can cause branches to break. While forest trees are just as prone to winter damage, yard trees present the most safety hazards and should be seen by an arborist as soon as damage becomes evident. Storm-damaged trees may have dangerous features such as hanging branches, branches under tension, spring poles and cracks in the main stem. Depending on the damage, some yard trees may also require pruning to correct their form and protect them from future injuries. Due to the dangers associated with storm-damaged trees, consider having a professional arborist or logger do your tree pruning or removal. Tree roots can be damaged in cold weather too. In areas of southern Wisconsin, a lack of snow during some of this winter’s cold snaps has forced the frost deep into the ground. Some of you may recall the winter of 2002-2003 when we had very little snow and frost went 5’ deep in many parts of the state. Not only did it freeze septic systems and water lines that winter, but it also damaged tree root systems by killing some of the fine roots and root tips that grow deep below the surface and prefer not to freeze. 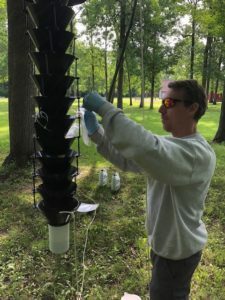 Trees that lost a significant number of roots experienced crown dieback and stress that led to insects and diseases attacks, including two-lined chestnut borer on oak and Armillaria root rot on conifers. Deep freeze damage to tree roots is not often the single cause of tree stress or death but is more often one of several stress agents that leave trees more susceptible to insects and diseases. Fortunately, the deep frost can be pulled out of the ground, and some of the damages avoided, if there is enough snow cover for the remainder of the winter. 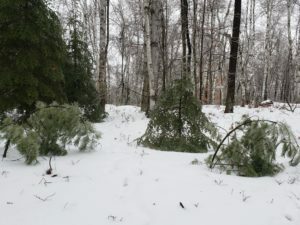 For more information on how snow and ice can impact trees, check out these resources from Wisconsin [PDF] and Minnesota. Contact a certified arborist or DNR forester if you want to discuss management options for storm-damaged trees. 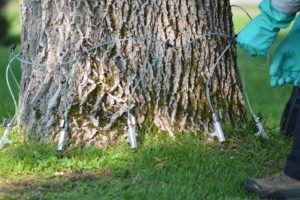 The Wisconsin Department of Natural Resources has released updated guidelines to reduce the risk of introduction and spread of Heterobasidion root disease (HRD) in Wisconsin through preventive stump treatments. The revised guidelines became effective on January 1, 2019, and a professionally designed version will be available soon. 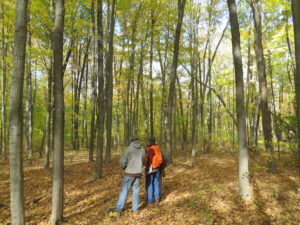 Woodland owners are strongly encouraged to work with a professional forester to make management decisions about HRD and preventive stump treatments. Pocket of HRD-caused thinning and mortality in red pine plantation, Grant County. 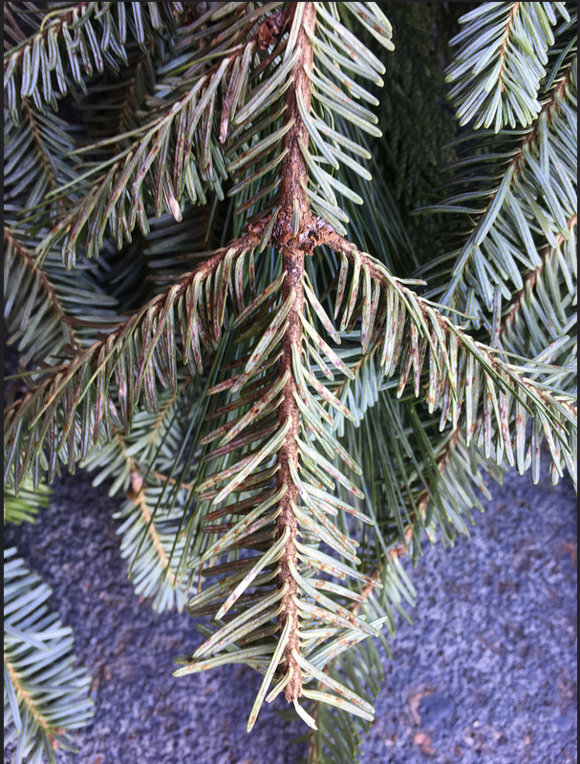 Heterobasidion root disease is one of the most destructive diseases affecting conifers in the Northern Hemisphere. 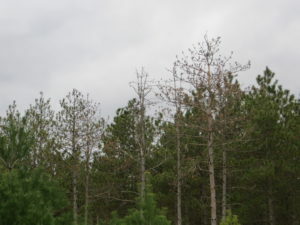 In Wisconsin, HRD is most commonly found in pine and spruce plantations. 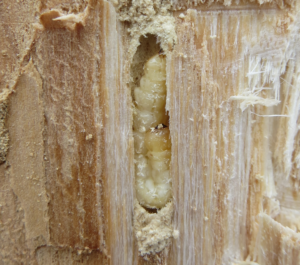 Infection by the wood-decaying Heterobasidion irregulare fungus kills living tissues and leads to growth loss and tree mortality. 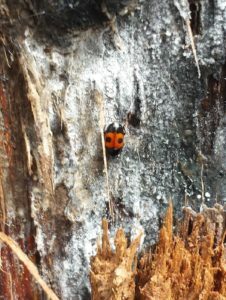 Spores landing on a fresh cut pine or spruce stump will infect that stump and root system and spread via root contact to neighboring trees, killing them as it invades their root systems. This pattern of spread creates pockets of dead and dying trees that expand outward. Growth reduction of trees leads to economic losses for plantation owners, and mortality of trees, including seedlings and saplings, has long-term implications for future stand composition and management. The HRD stump treatment guidelines are designed to help make decisions about the use of preventive stump treatments when harvesting a stand. These treatments limit disease introduction by preventing fungal spores from developing on the exposed surfaces of newly cut stumps. 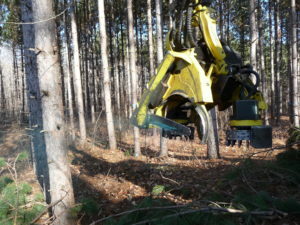 Pesticides used in stump treatments can be applied using logging equipment (blue mist exiting through nozzles in saw bar) or backpack sprayer. Along with the guidelines, a web-based HRD map viewer has been launched. This interactive map displays confirmed HRD locations and 25-mile and 6-mile radius buffers around HRD locations. The purpose of this map is to help users determine whether a stand is within either the 25 or 6-mile buffers where stump treatments are recommended. You can enter an address or GPS location, turn map layers on and off, and zoom in and out to an area of interest. 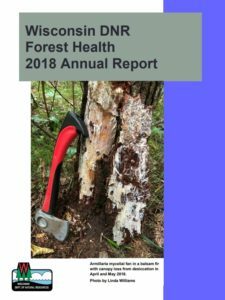 If you would like more information about HRD or these guidelines, visit the DNR HRD webpage or talk to your regional forest health specialist.